Products handwritten mating has always attracted special attention, as they have no pattern. And not only in the originality of ideas, but in the fact that even the simplest thing, such as a scarf, tied with love and care. And this is a lot! 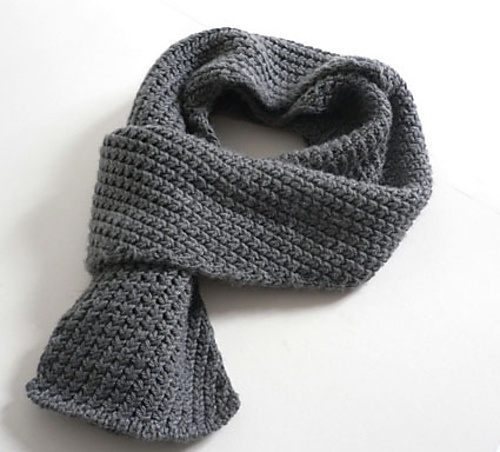 To tie a men's scarf crochet it is advisable to choose such colors that well harmonize with the predominant color scheme in the clothes of a man. Looks good the black color combination with dark green tones and palette, which includes black, brown, beige, white colors. Threads it is desirable to use soft, pleasant to the touch. Great mohair, Alpaca, Angora. Tricolor buklirovannye thread is great because both are the product and the volume and the harmonious combination of shades. You also need to determine what clothes you want to wear, how to tie a men's scarf crochet in various widths. Consider the scheme of knitting scarf medium width. Make a chain of loops 30, which will form the basis. Povezav the first row, it will be possible to have an idea of the appearance of the product, and therefore is not acceptable later their handiwork to correct. Optionally make two air loops, and then 30 loop provarite column with nakida. Continue to knit until the end of the row. Turn the knitting and before starting the next row again, do two air loops, and then tie the scarf in a column with nakida. Once connected the scarf, you need to make him or brush fringe. To do this, take a book with a width of 15 cm, wrap it and cut the yarn on both sides. You will get the same billets, which collect 6 pieces. Pull the edge of the scarf hook, grab the middle of the beam and pull the ends in a loop, and then tighten the brush. Upon completion of the work with brushes, lay the edge of the scarf on the table, comb, comb with a few teeth and then align the edges of the brushes. Watch carefully that the edges of the scarf remained smooth.